We have over 25,000 gallons of saltwater and work directly with Florida Fish and Wildlife holding training classes for field officers, assisting with classification of new species and overall sustainability of saltwater animals within the natural ecosystem of Florida. We have a unique view of the aquarium industry as many of the animals we discover have yet to be written about on a hobbyist level. These new saltwater animals are often a focus of videos, pictures and detailed account of these unique animals. In addition, we focus on providing an in depth view of the potential for aquaculture and long term sustainability of our reefs along the Florida coastline. 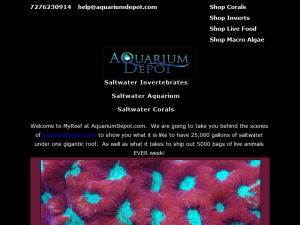 The post Some of our favorite saltwater reef pictures for marketing and viewing appeared first on My Reef. A fantastic fish for your coral reef tank! The post Banggai Cardinalfish – Is this the Fabulous Reef Safe Fish you have been looking for in your reef tank? appeared first on My Reef. Not feeding your Corals ? We break it down so you can fatten them up! A fat coral is a happy coral! The post Not feeding your Corals ? We break it down so you can fatten them up! A fat coral is a happy coral! appeared first on My Reef.